Due to unforeseen circumstances our previously advertised speaker for tomorrow’s Monthly General Meeting (Jan Nargar from Abbey Museum) is unable to attend. We are delighted to announce that local businesswoman, Jenise Horsman, has agreed to step in at short notice. We’re very grateful to Jenise and hope that Jan will be able to join us again at some point in the future. The September to November 2018 newsletter is now available along with past issues on the Newsletter page. This issue contains the President’s Annual Report along with a number of interesting articles and some photos from the Trivia Night. The latest newsletter is now online for your reading pleasure. Find it along with past issues on the Newsletter page. The latest newsletter is now available. Find it along with previous issues over on the Newsletters page. Tomorrow’s monthly members meeting promises to be a very interesting one. 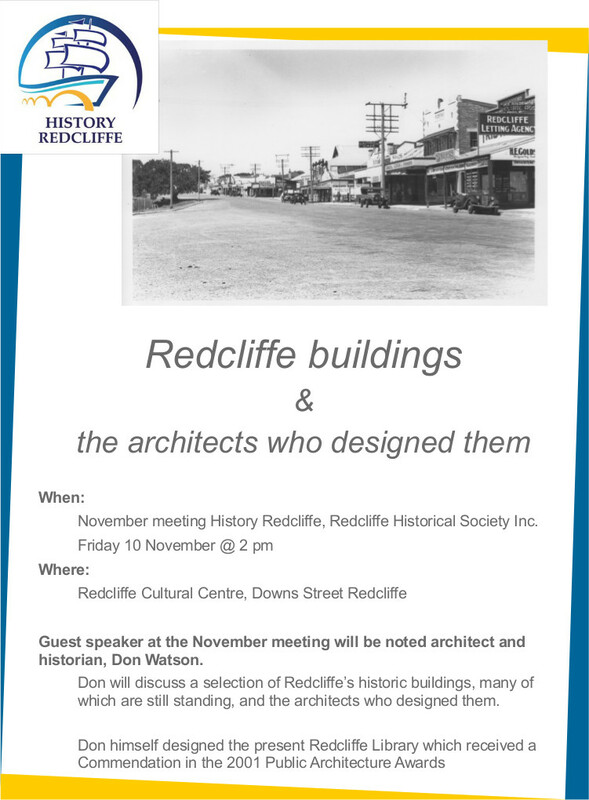 Guest speaker, Don Watson, will be talking about architects who have designed buildings in Redcliffe, many of which are still standing. Come and see our folks at the History Redcliffe marquee at Redcliffe Remembers. You’ll find us near Anzac Place. The latest newsletter (September to November 2017) is now available. Find it here on our our Newsletter page along with previous editions. The passing last Friday 11 August of Raymond James Frawley brought to an end the life of one of life’s gentlemen. Ray had a distinguished career with one of the highlights being serving as the Mayor of Redcliffe City Council for many years. There will be much written about him this week as he was one of Redcliffe leading citizens so I will leave the details of his life to his family. Ray was a Patron of History Redcliffe for many years. The calibre of the man can be judged by the message he sent to History Redcliffe when he could not attend our fiftieth birthday celebrations at the Redcliffe Leagues Club. An extract from this message is below. and thank them for their support. Our deepest sympathy goes to his family and friends. Well done Raymond James Frawley. You certainly have earnt the right to rest in peace. Tomorrow’s monthly meeting is also the AGM. It will be held at the Redcliffe Cultural Centre at 2pm in the Onoda Room. History Redcliffe is now on Instagram. You can find us here and follow us! Our first image to launch our feed is of the iconic Redcliffe Jetty taken around 1915.